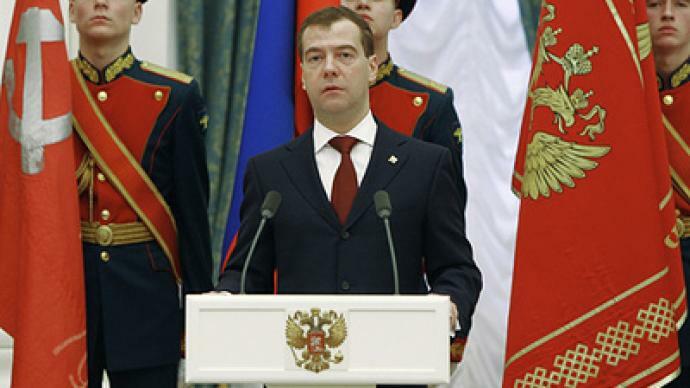 Russian President Dmitry Medvedev has congratulated the military forces and the Russian people on Fatherland Defenders’ Day. ­The head of the Russian state laid a wreath at the Tomb of the Unknown Soldier near the Kremlin wall and presented the honorary title of City of Military Glory to Vladivostok, Tver and Tikhvin. "In our country, the military’s work has always been treated with respect," Medvedev said at the ceremony. "Military service unites people with strong courage, those for whom military duty and love for the Fatherland are most important," he said. Earlier in the day, the president acknowledged all military servicemen on their holiday with a post on his Twitter microblog. “Russia needs peace and that means we must be strong,” the president wrote.